The Bulldog Cover Clipper Brown in leather is a very comfortable lighter cover, with the original The Bulldog Amsterdam engraved logo. 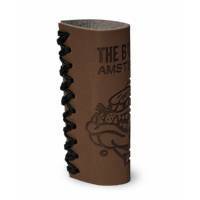 The Bulldog Cover Clipper Brown in leather is a very comfortable lighter cover, with the original The Bulldog Amsterdam engraved logo. Perfect for Logo Clipper and Transparent Clipper.